Breakfast this morning was in the Bistro on Five where they feature crepes for breakfast and lunch. The crepes are filled with scrambled eggs and your choice of cheese, veggies, and meat, accompanied by a scoop of lovely browned potatoes. There is a $5 service fee for the Bistro but the crepes were truly worth the extra charge to eat there. And I didn’t have to play “bumper plates” in the buffet area. We attended the next lecture in the series, Rogers and Hart. Once again Marlene and Chet Solender were wonderful. Even with it being so early in the morning, her voice was true and resonant as she sang and Chet’s humor was delightful. I’m looking forward to the next one: Rogers and Hammerstein. 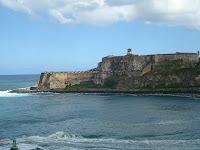 After lunch, we arrived in San Juan, passing the wonderful old fort as we headed into the harbor. The ship was quickly cleared by the authorities and we disembarked with the crowd of eager cruisers. 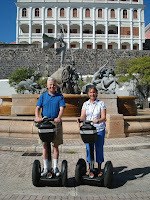 Normally, we would let the landlubbers off first and follow at a more leisurely pace but we had made reservations for a Segway tour of old San Juan and the tour was to depart just a few minutes after our arrival. We turned le ft at the end of Dock 3 and walked a quick two minutes to Dock 2 where there are several little shops including a Subway and in the back, a Segway tours operation. The ship’s cost for a Segway excursion was about $95. We paid a little over $40 plus tip for ours. The tour guide was wonderful giving us some quick lessons on the operation of the Segways and then taking us through the park area and into a section of Old Town where she stopped several times to give us a little history and remark on the things around us. One of the new facts we learned about San Juan was that there is a population of about 100 cats, all spayed and neutered (indicated by one ear slightly lopped off at the point) who are cared for by the city and in return take care of the mice population. There are virtually no mice or rats to be seen anywhere—according to our guide. The Segway tour lasted about an hour and a half—the tour part, a little over 45 minutes. Once we returned the Segways, we walked back to the ship. We’ve been in San Juan at least a half dozen times and really appreciate using the ship’s amenities when there are fewer people around. Bob went off to exercise and I took advantage of the Solarium pool to ge t in a few laps. There were few people around. For dinner, we ate in the Grand Epernay again at our assigned table and met two more tablemates who had been missing the first night. The food was wonderful. 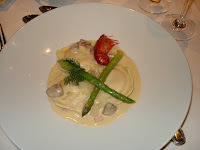 Bob had leg of lamb that was fork-tender and I had lobster ravioli that was delicate and delightful right down to the fanciful little crayfish that adorned it. As always our service was excellent. Knowing that we all love the breadsticks, I noticed our breadbasket brimming with them. We watched the sail-away a little after eight. It’s always fun to watch the last minute passenger, or in this case crew member, run for the ship as the lines are being brought in and the gangway raised. It was a wonderful evening—warm with a slight breeze and we stayed on the Promenade Deck until passing the fort that was illuminated with soft lights. Bob went on to see the show in the theater which was a musician, David Meyer, and his dancing wife. He played an unusual synthesized xylophone. Bob reported it was quite a show and very good. 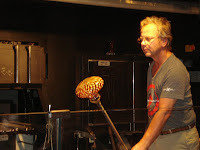 I did a little wandering about the shops and the casino and then went up to the Hot Glass Blowing Show on Deck 15. The glass blowing is sponsored by Corning of New York. 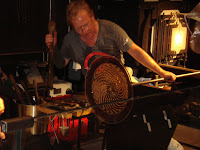 The three who provide the talent are all experienced glass blowers. The ovens themselves are unique in that they are the first to be electrical. Since they could not have gas or propane on the ship, engineers had to design and construct ovens that c ould heat up to 2000 degrees for the needs of the glass molding. The show is about 2-2 ½ hours long and is narrated by one of the artists as they fashion their creation for the evening. 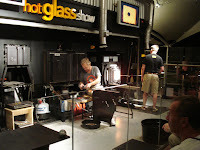 There are television monitors that show the glass inside the oven as well as giving you overhead shots of the artists as they craft the glassware. None of the glassware made on board is for sale but they do hold a free raffle at the end of the show for several pieces. There is a deal in the works to sell the pieces at the art auction and give the proceeds to charity so I’m sure the raffles will stop after that. One of the shows will feature the kids on the ship. As we were told, they will ask the kids to make original drawin gs for a design on the glass and one of them will be chosen. Then the kids get to watch it being made and the one whose design is picked, gets to keep the glassware. The glass show is outdoors and the soft warm breeze and evening air combined to do us in. We headed straight for bed—after all, those Segways were a lot more exercise than we’re used to. Or maybe not.